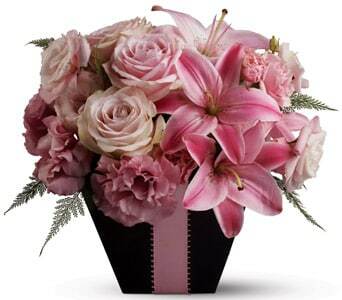 Searching for a floral arrangement that�s fabulous and flirty? Look no further than this blushing arrangement, created entirely from blossoms in pretty shades of pink and accented with a pink satin ribbon. Easy site access and beautiful flowers. as was sent to an employees family members funeral I didn't see the arrangement but was told it was lovely. A lovely bouquet, much appreciated and loved by recipient.